If you’re reading this I can assume that you’re here because you’re suffering or know someone suffering with (osteo)arthritis and are looking form of pain relief and treatment. So I’d like to start by giving a brief explanation of what arthritis is then we’ll get right into the good stuff where I’ll be giving you my best exercises for arthritic knee pain. So, arthritis is a degenerative condition that develops as a result of ageing and general wear & tear throughout the years. It’s a condition that effects the joints around the body, more commonly so in the knees due to the constant weight-bearing nature of the joint. Arthritis targets the cartilage in the joints and causes degeneration which leads to a reduction in joint space and increase of bone on bone activity. People that suffer from arthritis typically have symptoms of pain, inflammation, joint crepitus (creaky joints), and joint stiffness. Doctors traditionally like to treat people using anti-inflammatories, pain killers, and other medication but who wants that? There are much better ways to combat arthritic knee pain, such as exercise and diet. How to Exercise with Arthritis…? I often get asked “How can you exercise with arthritis?” and funnily enough exercise is the best form of treatment for arthritis, the main problem is that people don’t know what they should be doing. 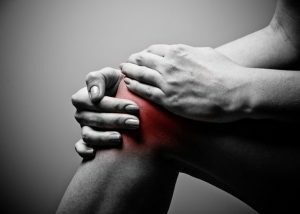 Speaking from my own experience and the backing of extensive amounts of research, the best outcomes for arthritic knee pain relief are found when patients are regularly (3+ times a week) performing a quadriceps strengthening routine alongside low impact aerobic activity, such as, swimming, cycling, rowing, and walking. A lunge is slightly advanced but can be modified to suit everyones ability. Begin by taking a big step forward, bend the front knee so that your back knee drops but make sure to not lean forward, once your back knee is an inch from the floor stand up and repeat on the other leg. If this is to difficult to do to start with you can hold onto a chair or reduce the depth of the lunge. This is a simple yet very effective quadriceps strengthening exercise which I highly recommend. For leg extensions you will need a resistance band (start with light and progress to heavier resistance). Tie the resistance band around a chair leg and the other end around your ankle so that when you’re sat down with your feet on the floor there isn’t much give in the band. Once you’re sat down, all you’re going to do is straighten your knee out until it is locked out and your leg is parallel with the floor, control your leg back down to the floor and repeat. If you have access to a gym then this can be done with a low weight on a leg extension machine. Lock outs are another simple exercise that you can do but still very effective. Begin sat on the floor with your legs out straight, a rolled/folded towel should be placed underneath the back of your knee. From this position, all you’re going to do is push the back of your knee into the towel as hard as you can, without jolting your knee of course! Then relax and repeat. This exercise is different to the others already mentioned in that there are no instructions. 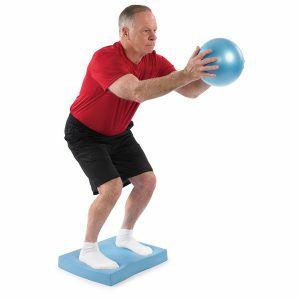 The stability pad is essentially a foam pad that is used to help improve ankle and knee stability. Realistically, you could perform your squats and lunges on this as a progression or if you have a ball your can throw and catch off the wall to help improve the balance and stability in the knee. This is a great piece of equipment and would highly recommend investing in one it will last a very long time. Squat holds are another great exercise to help with arthritic knees. 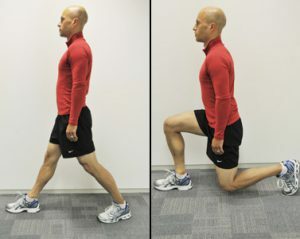 Begin this exercise stand with your back against a wall, feet out in front of you, shoulder width apart. Start to slide down the wall until your legs are parallel with the floor (or above that if you don’t feel comfortable with that depth) and hold that position. On your way up, make sure you have something to hold onto to assist. An important part of rehab for arthritic knees is to strengthen and stabilise the lock out of the knee, this exercise is perfect for encouraging that. Begin laying on your back with your legs straight (you will perform this exercise one leg at a time), lock your knee out and raise your leg as high as it will go then lower back to the starting point, focus on keeping your knee locked at all times. Repeat with other leg. To progress, resistance can be added if you’re finding this too easy. Anyways, I hope you enjoyed reading and found this blog helpful. If you have any questions or would like any further information then please get in touch.